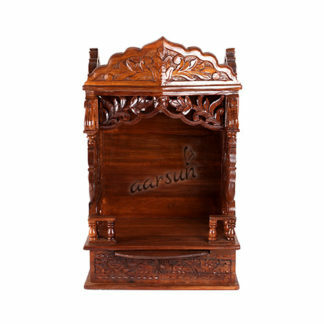 Aarsun Woods brings to you this handmade Wooden temple / Mandir / Pooja Ghar suitable for homes and offices. the Temple is made from Premium Quality Mango Wood with traditional carving and finishing. Beautifully handcrafted designer Carved Wooden Temple is an intricately crafted art piece made from high quality Premium Wood Mandir / Temple for home hand carved by skilled artisans from Seasoned Mango Wood. Wall Mountable. The Carved Wooden Temple is exquisitely handcrafted by our skilled craftsmen with immense care.Hand-carved by skilled artisans with dual polishing and smooth finishing. The detailed and the intricate work done on the Carved Wooden Temple, makes it ideal to decorate the worship place.Contact us in case you need any other size or designs. We are the manufacturers and can customize the unit as per your requirement.